If you enjoy biking the great outdoors, but hate leaving valuables behind, this all-inclusive cycle kit is the answer to your prayers. Cycling is not only great exercise, but it's a fun way to travel. However bikes don't have much on-board storage. Not only that, but many bicycle pants don't have adequate pocket space for taking along your valuables. You certainly don't want to leave things like your wireless devices, wallet, glasses and other items in the car where you can't keep an eye on them. Especially if you're planning an all-day ride or an overnight stay. There's no reason to leave any of your stuff behind! The BVB Sports Bicycle Kit comes with everything you need to hit the road. Don't worry about your personal belongings not being secured, or getting stuck in a remote location in need of a repair. It's important to stay properly hydrated out on the road. BVB Sports is here to make sure you're prepared! Water bottles aren't practical, but our water backpack is an ingenious way to carry liquid refreshments and deliver it to your mouth. No need to take your hands off the handlebar and your eyes off the road to reach for a water bottle, which can be dangerous. Riding for long hours can cause pressure on your legs and pelvic region, which can lead to numbness. Our silicone seat cushion lets you ride longer and in total comfort for a more enjoyable riding experience. No need to purchase anything extra; this kit gives you everything in one package. Handlebar dock for phones makes using your phone's GPS a breeze when you're out on a trip. Made of durable, high strength plastic. 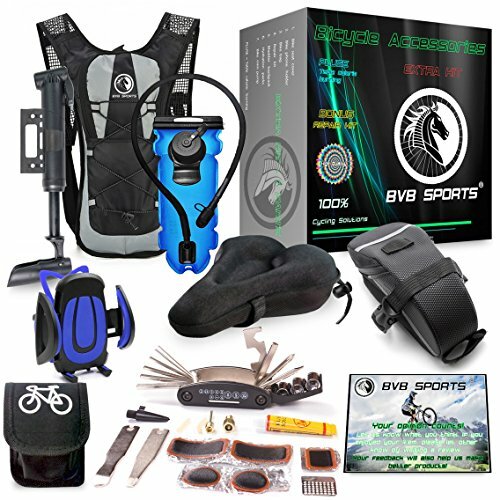 The BVB Sports bike kit comes with unique customer support straight from the seller. So what are you waiting for?!. Don't wait! Enjoy. If you have any questions about this product by BvBbicycle, contact us by completing and submitting the form below. If you are looking for a specif part number, please include it with your message.